An experiential learning experience that combines research, hands-on community service learning projects, & eco-adventure. At the heart of this program is the interdisciplinary collaborative community service learning component that invites students from any discipline to join hands to analyze existing problems in the community and offer solutions. 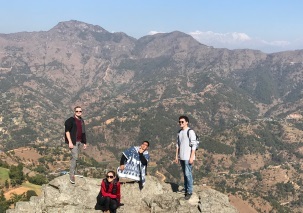 The study abroad program is built upon an interdisciplinary course called The Sustainable development action lab, offered by the Department of Economics at the University of New Mexico, USA. A. This year the team completed 5 projects on tracking environmental attributes and raising awareness. 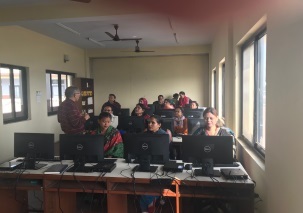 The UNM team set up a network of pollution sensors in Butwal and Siddharthanagar (schools), which you can track live through this website: purpleair.com . Working with the local collaborators - a non-profit NGO, PNMF and its polytechnic college PNC - DEMP (modeled after the New Mexico’s BEMP) was developed to track various environmental parameters and to help spread awareness regarding air pollution, water pollution, weather, river flow dynamics, bio-diversity, and waste management around the city of Siddharthanagar. This year the UNM group chose three schools (public and private) to install a network of outdoor pollution tracking sensors in various parts of the city. This live streaming pollution data can be viewed on the website PurpleAir.com by searching for the country of Nepal. The UNM student team also designed and helped build a prototype Neighborhood Billboard structure and a shaded-platform for the purpose of spreading awareness messages by displaying an easy-to-understand poster. 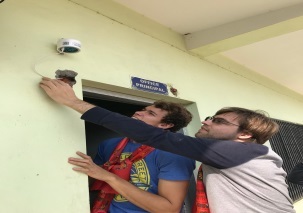 The DEMP lab on the host’s campus ground also saw the installation of a ground water level monitoring device. 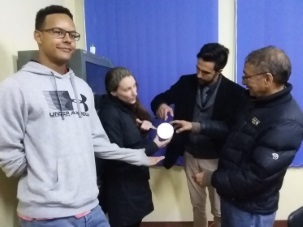 The UNM team interacted with the neighborhood mother's group and college students and shared some of their scientific research they had carried out at UNM's classroom. 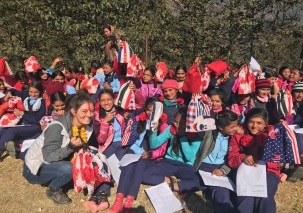 The team then went on the hill tour and crossed three districts -- Kapilvastu, Arghakachi and and Gulmi to carry out the "W4W menstruation kits distribution and awareness project" in a school in Gulmi District. The group then went on a hill circle tour to observe and experience various sustainable development activities and cultures. 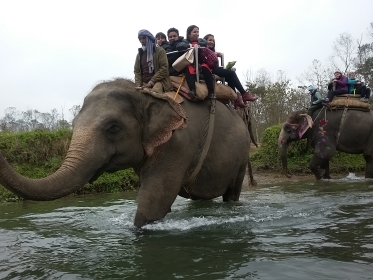 Finally, the students visited a world renowned wildlife conservation site Chitwan National Park, famous for rhinos, tigers, crocodiles, and bird species (activities/observations: elephant and alligator breeding sites/farms, rhinos viewing, river canoe trip, jungle walk, invasive species, and park management etc.). 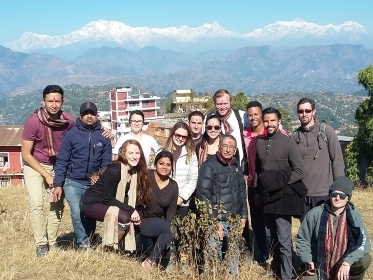 An interdisciplinary group of University of New Mexico (UNM) students traveled to Nepal on the Himalayan Study Abroad Program this December (December 19th, 2017- January 6th, 2018) offered by the Nepal Study Center (NSC) and Department of Economics. 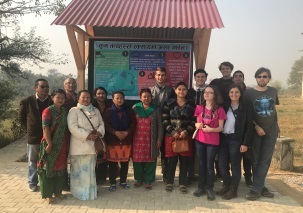 The mission of this study abroad program was to build a Citizen Science (CS) Initiative, in particular, to develop and implement the Danda Ecological Monitoring Program (DEMP) developed by a series of students in previous economics courses under the NSC's Sustainable Development Action Lab concept. Working with the local collaborators (a non-profit NGO, PNMF and its polytechnic college, PNMHI), DEMP was developed to track various environmental parameters and to help spread awareness regarding air pollution, water pollution, weather, river flow dynamics, bio-diversity & waste management around the city of Siddharthanagar. 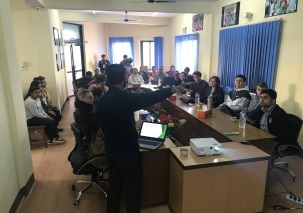 The UNM group met with the Mayor of Siddharthanagar and expressed interest to help link the Nepal CS program with the similar conservation initiatives in New Mexico. Our students also participated in a Seminar Abroad event jointly with the local students presenting their work. 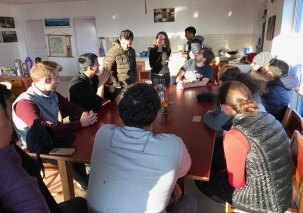 The group then went on a hill circle tour to observe and experience various sustainable development activities and cultures. They also participated in a community service project that distributed reusable mensuration kits to women in a rural school (10th, 11th, 12th grades) and carried out a survey to help identify women's health needs. 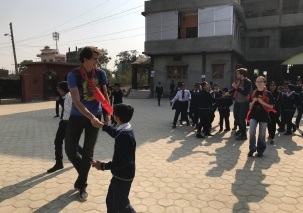 DEMP will provide continued community engaged research opportunities for other UNM undergraduate and graduate students in Nepal. 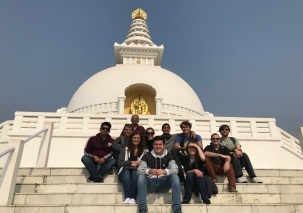 Students from the recent study abroad program will also be participating in an undergraduate panel of the Southwestern Society of Economists (SSE) Annual Meeting to present their research and share their experiences. 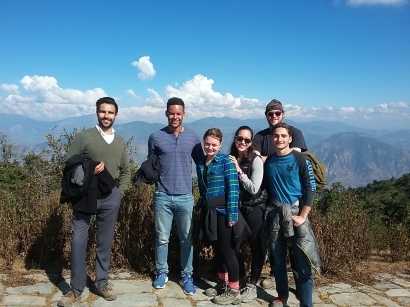 The study abroad program was co-led by Professor Alok Bohara and Michael Benjamin Goodwin (graduate student, economics department). 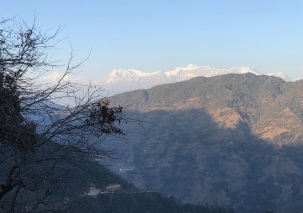 Manakamana Hill: Cable car ride across the Trishuli Rive and up to a mountain top. Siddharhanagar: Engage in citizen science pilot projects such as the long-term water and air quality monitoring; and scope out the future Urban Wildlife Refuge sites along the Danda River. Lumbini and Kapilvastu: 650 BC World Heritage cultural sites visit (birthplace of Buddha). Madhane Community Health Center: Explore sustainable development projects such as, health care and hygiene, organic farming experiments, and clean stove; Arubindo Ashram spiritual eco-adventure and bio-diversity tour and experience. Tamghas Valley: Hill-top nature hike through singing forest. Ridi: Kali Gandaki River valley and canyon trip. Study Abroad Collaborator and the Citizen Science Project Platforms: A non-profit local organization PNMF, its college campus, and its international research platform LCS. 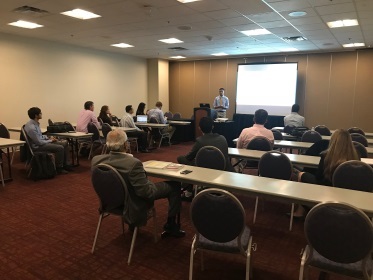 Southwester Society of Economists Annual Meeting (SSE 2018) in Albuquerque, New Mexico during March 7 - 10, 2018. SSE 2018 held in conjunction with the Federation of Business Disciplines (FBD) Annual Conference. "The group had a little packing party before we depart on Sunday. All the supplies (air sensors, water testing kits, river stage monitors, safety materials, etc.. ) are packed away in everyone's bags. Here we come Nepal!" 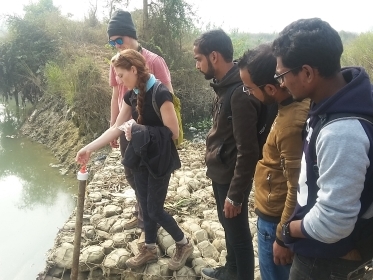 "Before the Yogdan group heads out to Nepal this December, it's important that they practice all the environmental monitoring protocols. Enjoy a little video of a couple of students gathering a water quality sample from the Rio Grande to practice testing the water quality." "This is just the beginning of a diverse forest that is ready to change the fate of an untold amount of people world wide. 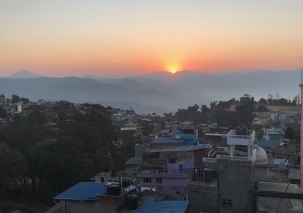 Kathmandu is the first adventure, its rich cultural density, history, diversity, and beautiful land is the perfect representation of what Nepal brings to the world as well as what the people of Nepal can bring to the global community." 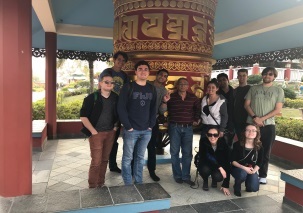 "Our first day exploring Kathmandu begins with the surprise stop to visit some cute critters that enjoy the offerings at the Syambhu Nath (stupa). 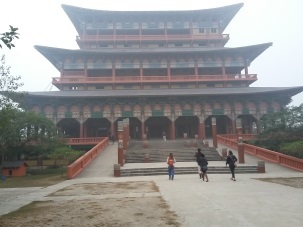 The day was filled with peaceful stupas, delightful ginger tea, and deep historic explanation on the city of Kathmandu." 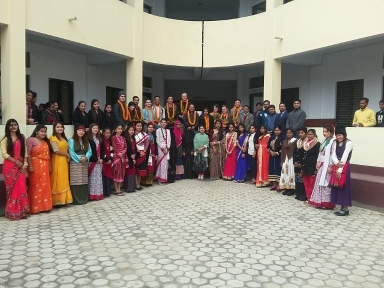 "Day Three was our first day at the Pratiman Neema Memorial Foundation. We were welcomed by a thankful and generous community of faculty and students with a massive amount of flowers and selfies. Our day consisted of introductions and guest lectures that outlined our mission for the following eight days as we work together to improve the Danda River and the health and awareness of the community." 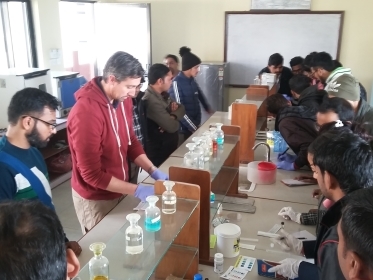 "What started off as a nerve-wracking and uncertain day filled with presenting our semester-long work turned out to be a day where each of us learned something new. 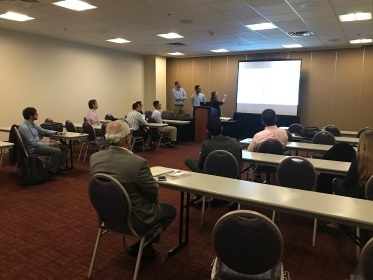 In addition to getting over our stage fright, our group had the joy of listening to a couple of students from PNMHI present their own findings. I was very impressed with their work!" 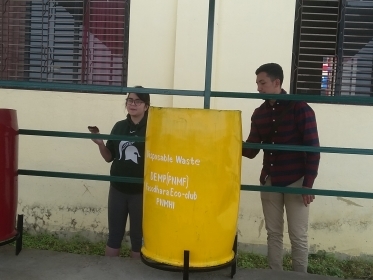 "We installed the Laser Egg and The Weather Station and along the way worked with the eco-club and mentors to properly learn how it functions and uploads data properly." "Well of course we stopped for tea and graceful took in the beautiful Himalayan view! After being in the city for a while and crammed in the cars, turning that windy corner and then, BAM! there emerges the amazing mountains as vast and mysterious as we had hoped." 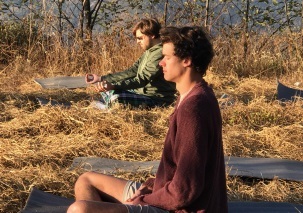 "I can not possibly think of a better way to start the new year than with meditation and early morning yoga at the Arubindo Ashram. The feeling of the crisp morning air and the sun on my face as we sat on a plateau overlooking the mountains is both humbling and empowering. The massive landscape around us reminded me of what little place we take in the world. Yet, it also reminded me of the importance of the role we play in the world, and motivated me to keep working for a better environment and well-being for everyone." "While our efforts to bring resources and education on feminine hygiene and menstruation are undoubtedly a huge step of progress for the girls at the school we visited, I can’t help but think of all the progress that can still be made in this subject. After learning more about the cultural stigmas of female menstruation, I was both fired up and inspired to learn more about the changes possible. Education, resources, and a shift in outdated traditions are all necessary for a healthy lifestyle for women, especially in rural parts of Nepal."